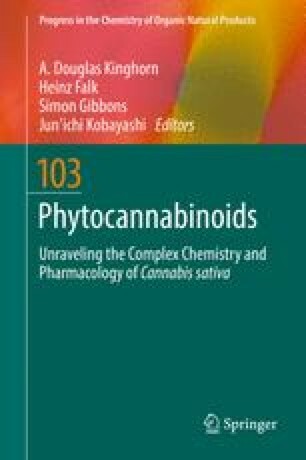 Phytochemistry of Cannabis sativa L.
Cannabis (Cannabis sativa, or hemp) and its constituents—in particular the cannabinoids—have been the focus of extensive chemical and biological research for almost half a century since the discovery of the chemical structure of its major active constituent, Δ9-tetrahydrocannabinol (Δ9-THC). The plant’s behavioral and psychotropic effects are attributed to its content of this class of compounds, the cannabinoids, primarily Δ9-THC, which is produced mainly in the leaves and flower buds of the plant. Besides Δ9-THC, there are also non-psychoactive cannabinoids with several medicinal functions, such as cannabidiol (CBD), cannabichromene (CBC), and cannabigerol (CBG), along with other non-cannabinoid constituents belonging to diverse classes of natural products. Today, more than 560 constituents have been identified in cannabis. The recent discoveries of the medicinal properties of cannabis and the cannabinoids in addition to their potential applications in the treatment of a number of serious illnesses, such as glaucoma, depression, neuralgia, multiple sclerosis, Alzheimer’s, and alleviation of symptoms of HIV/AIDS and cancer, have given momentum to the quest for further understanding the chemistry, biology, and medicinal properties of this plant. This contribution presents an overview of the botany, cultivation aspects, and the phytochemistry of cannabis and its chemical constituents. Particular emphasis is placed on the newly-identified/isolated compounds. In addition, techniques for isolation of cannabis constituents and analytical methods used for qualitative and quantitative analysis of cannabis and its products are also reviewed.